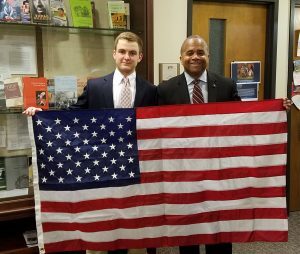 George presented this flag to Dr. Johnson in memory of his late father, Fred Johnson Jr., who served in the U.S. Air Force for 20 years. In the spring of 2016, I signed up for two History classes to fill some requirements for my degree at Hope College and learn some new things about the US and European history. What I got out of the classes was much more than I anticipated. I believe everything in life happens for a reason and I thank God that I took both of Professor Johnson’s classes. I am from a large city right outside of Washington, DC– the historic town of Alexandria, VA. Anyone from that area knows that Washington, D.C. and the surrounding suburbs in Maryland and Virginia are heavily liberal. Growing up, especially in high school, I was often teased and bullied because of my conservative political beliefs. Those experiences strengthened my political convictions but at the same time made me less accepting of other’s views. Hope College is a slightly more conservative environment than where I had come from and gave me a sense of community and gratitude for something I had never experienced before. However, it initially made me gravitate more toward conservative professors because of my high school experiences. Professor Johnson changed my entire perspective on political relations in this country. As a conservative, when I first had Professor Johnson, I was very quick to jump to conclusions that he was going to be just another “liberal” professor trying to bash Republicans and push the Democratic agenda on millennials. I could not have been more wrong. Throughout both courses with him, I saw that he encourages his students on both sides of the aisle to advocate for their individual views, urging them to base their arguments on facts rather than just opinion. He doesn’t care what your specific political perspective is, but he very much cares that you are informed when you form your own opinions. He has made me a better writer, scholar, and I have earned a good friend. When I talked to him about the exclusion I endured in high school because of my own political views, he related those to the racial discrimination he received growing up as a kid. Professor Johnson described how our culture and our ideologies make us uniquely different. From the conversations we had, he helped me understand that you need to not only listen to the perspectives of other people, but also understand and appreciate different views that make us Americans. It is about time we had a culture change where we appreciate people’s differences instead of just associating with those who are just like us. I’m glad that, by doing that, I was able to make a lifelong friend.